Videoconferencing is one of the most innovative tools available in the modern fast-paced market that allows accomplishing both goals. It gives any business the edge of effective communication and collaboration with multiple selected business associates and clients simultaneously. The basic areas of video conferencing application, apart from business are the medical sector, legal sector, and education, especially broadcasting training. So where to start if you just want to simply live stream a video conference without installing software, setting up servers, or configuring video conference systems? Video conferencing organizers can now perform live video streaming of a single display video conference system without costly and complex solutions. Epiphan’s broadcaster hardware streaming product family offers high-performance video conference streaming solutions that allow broadcasting of video conference events to remote audiences – by simply intercepting, encoding, then streaming of the video conference system’s VGA, DVI or HDMI™ video output. No software to install. These products are an effective means of delivering different audio-video conference streams through the network. This capability enables a meeting holder to transmit live video streaming of a video conference. In the case where a video conference system outputs the remote participants to individual video screens, Epiphan recommends VGA Grid. VGA Grid can encode each of the video displays and then streaming to one or more output channel streams. The system can also combine all the streams, or some of the streams in to different views than can be viewed remotely by simply visiting different URLs for each view. 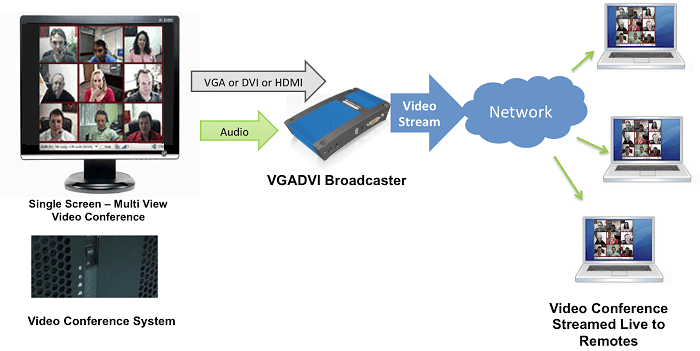 How does video conferencing work with the VGADVI Broadcaster™ video-to-Internet broadcast appliance? How to stream live video using this solution? Read on to know more on this subject. In our example the video conference organizers will stream the VGA/DVI/HDMI output from a video conference system. These include simple video collaborations systems such as Skype, Google+, FaceTime or sophisticated systems from Polycom, Tandberg, etc.. 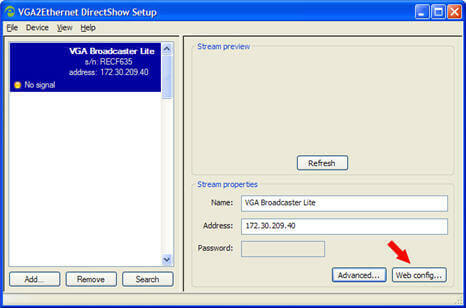 The first step is to setup VGADVI Broadcaster so that it is streaming a display sources to the internet. Using a simple computer display is a good way to test this setup. Connect the VGADVI Broadcaster to the Network through its Ethernet RJ-45 port. Connect a microphone to broadcaster’s audio in port. If you know the URL/IP address of the broadcast, use it with your browser or media player to make sure the video/audio feed is streamed over the network. If you do not know the URL/IP address, perform this operation in the step 2. If you do not know the URL IP address for your VGADVI Broadcaster installed above, download the Network Discovery Utility from the VGADVI Broadcaster product page to the laptop you are using to configure the system. Your broadcaster will be found on the network. Its IP address will be also available. Provide the participants with this information. 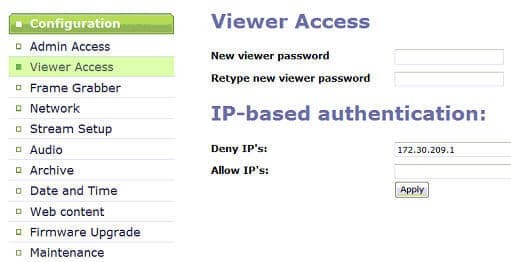 Click on the Viewer Access section of the interface to set up the viewer’s access to the broadcast. Specify the viewer password. 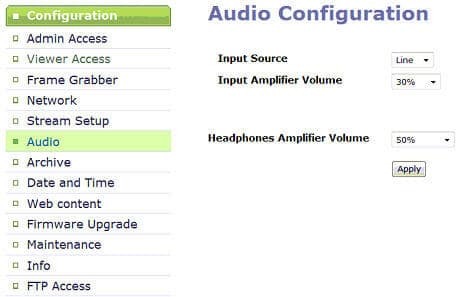 To adjust the audio settings use the Audio section of the Web access interface. Now you know how to stream live video with VGADVI Broadcaster. Once the participants know the address of the streaming broadcast and the viewer broadcast’s credentials, they are able to watch and listen to the video conference. They are required to start up a browser in their laptops and enter the broadcast’s address. That’s it. The participants will view on their laptops and hear the narrator standing or sitting in front of the camcorder. Broadcaster supports up to 1080p30 HD broadcast rate and can be used for live video streaming in HD quality. While all of Epiphan’s products don’t require the use of an external cloud service, media server, content management system (CMS), or CDN, you can use any Epiphan streaming & recording product as a capture device for these services. Epiphan products allow you to stream to media server software such as Wowza Streaming Engine or even free services such as YouTube.